Home / Blogoversary / Exclusive Giveaways / Giveaway / 2 Year Blogoversary Celebration Giveaways! !~ 2 Giveaways, 5 Winners and Over $170 in Prizes!!! 2 Year Blogoversary Celebration Giveaways! !~ 2 Giveaways, 5 Winners and Over $170 in Prizes!!! 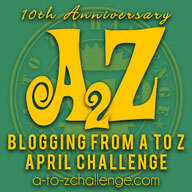 Thanks to all my fabulous followers and readers who have supported me and helped me make this blog what it is today. 2 years have flown by and I have enjoyed every second of this very adventurous journey where I met talented authors, supportive and helpful bloggers, cool readers and dedicated publishers and publicists. It's been a memorable experience. I have read so many great books and met and befriended book lovers and authors from all over the globe. Wish I could send each one of you a prize! But with the help of some very talented and cool authors, I have come up with 2 Mega Giveaways so you can win over $170 worth of prizes including Bestselling Books, Gift Cards and Paypal Cash. 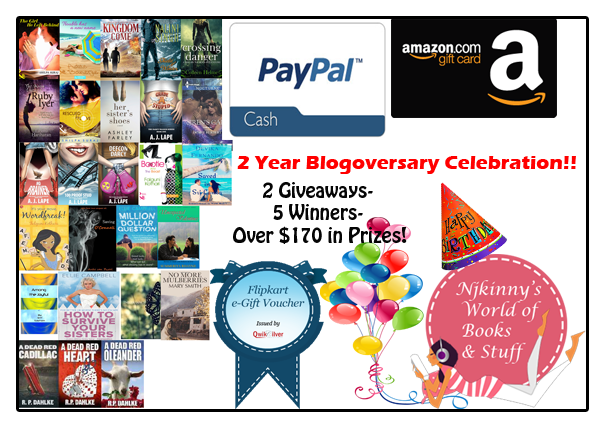 2 Year Blogoversary Celebration Giveaways!! Open to Indian residents only. Open only to those who can legally enter, receive and use an Flipkart.com Gift Card and have a valid postal address in India. Winning Entry will be verified prior to prize being awarded.No purchase necessary. You must be 18 or older to enter or have your parent enter for you. The winner will be chosen by rafflecopter and announced here as well as emailed and will have 48 hours to respond or a new winner will be chosen. This giveaway is in no way associated with Facebook, Twitter, Rafflecopter or any other entity unless otherwise specified. The number of eligible entries received determines the odds of winning. Giveaway was organized by Nikita (Njkinny) from Njkinny's World of Books & Stuff and sponsored by the participating authors. VOID WHERE PROHIBITED BY LAW. Open only to those who can legally enter, receive and use an Amazon.com Gift Card, Paypal Cash and have a valid postal address anywhere in the world. Winning Entry will be verified prior to prize being awarded.No purchase necessary. You must be 18 or older to enter or have your parent enter for you. The winner will be chosen by rafflecopter and announced here as well as emailed and will have 48 hours to respond or a new winner will be chosen. This giveaway is in no way associated with Facebook, Twitter, Rafflecopter or any other entity unless otherwise specified. The number of eligible entries received determines the odds of winning. Giveaway was organized by Nikita (Njkinny) from Njkinny's World of Books & Stuff and sponsored by the participating authors. VOID WHERE PROHIBITED BY LAW.